Easy twist spout caps assist you when it comes time to apply your one-of-a-kind hair growing solution. The small hole in the end of each spout makes it easy for you to target the desired spot directly. 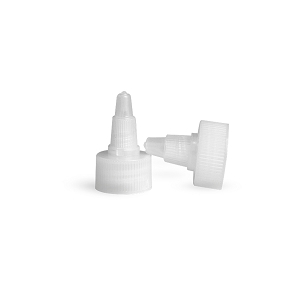 If you are treating your whole scalp, these twist spout caps enable you to apply the oil directly to the scalp rather than wasting it on your hair. It also assists you by releasing the desired amount of hair growth oil every time, as the oil releases depending on the amount of pressure kept on the bottle of hair growth oil. The small size twist spout caps fit the 1-ounce and 2-ounce bottles and 4-ounce bottles, with neck sizes 20/410. The large size twist spout caps fit the 8-ounce and 16-ounce bottles, with neck sizes 24/410. Every bottle of hair growth oil up to 8 ounces comes with easy twist spout caps included. These spout caps are to be ordered as extras, or as needed.